Hi Jaya, this blog does showcases the ruminations of a dog on the world as he sees it but the voice is not of a dog alone. The voice is as much of the bear who befriends a young girl to that of countless buffaloes and goats who lose their lives over a goddess. This blog doesn’t claims to be a puritan but just tries to spark that one solitary thought wave in a human cerebrum that could make a difference to those around him/her. Its easy to fall into the premise of ‘White Dog’ by labeling it as you have put it; ‘A dog acting aggressive like a crazed pit bull’. This movie nowhere places the blame on the dog. On the contrary, the movie mocks humans as you see how a wicked man has turned even an animal(who doesn’t differentiates on the basis of color), a racist. 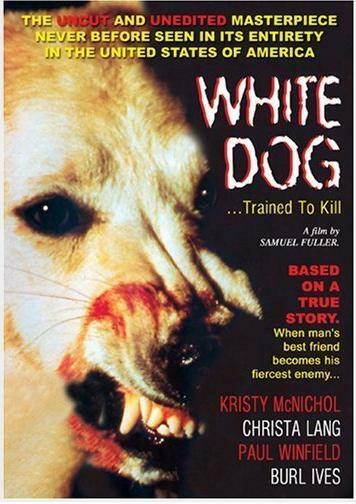 The ‘White Dog’ is not ‘Cujo’ or ‘Hachiko’ but showcases something that was as real as apartheid in the US. Its the most profound statement against racism because it is through the eyes of a dog. Beautiful review…makes me want to watch it straightaway! Now to try and get my hands on this. The search begins. Pingback: Movie Review White God : Rise of the Dogs! Next Next post: Those who found home: Happy B’day Elsa!